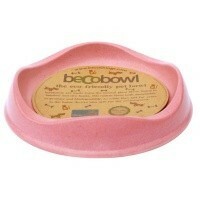 The Beco Cat Feed Bowl Pink is a sustainable and biodegradable bowl which has been made from waste plant fibre materials. This eco-friendly and practical product is tough and durable and will therefore last for years in your home. Designed with a lower rim to make meal times easier for your feline friend, this Beco cat feed bowl is also dishwasher friendly.